There are a variety of circumstances in which someone might lose a tooth. Injuries related to sports or car accidents often result in teeth being knocked out. Genetics can also play a role in whether your teeth are more prone to decay and infection, causing severe tooth damage that requires extraction. Thanks to innovative technology, dental implants have become the more popular option to replace missing teeth to improve the health of your smile. Millidge Place Dental Clinic in Saint John, NB offers dental implant restorations to patients with implants. Dr. Murray Holburn will examine a patient’s dental condition to find out if implants will be a successful method of returning best function back into the patient’s bite while providing a seamless smile that will look natural. Depending on how many teeth are missing and in what position within the mouth, our Saint John dentist will explore restorative options. Because dental implants offer the most predictable results, it is easy to explore restoration options ahead of time. A dental implant utilizes a small titanium screw used to replace the roots of a tooth. This post is surgically inserted into either the upper or lower jawbone. Because titanium is biocompatible, the implant is able to fuse with the bone and make it a great anchor for the artificial tooth. The final step in the implant process involves the placement of a prosthetic tooth on top of an abutment that secures the new tooth to the implant. When it comes to dental implant restorations, there are two main types: single-tooth and implant-supported restorations, such as a bridge. Each variation has a distinct advantage over traditional methods. For people missing just one tooth, an implant is often the best option. Unlike with other treatments, a single-tooth implant does not affect any of the nearby teeth, standing independently thanks to its standalone support system. As the implant is created to seamlessly fit into the gap and the restoration color will be made to match the neighboring teeth. 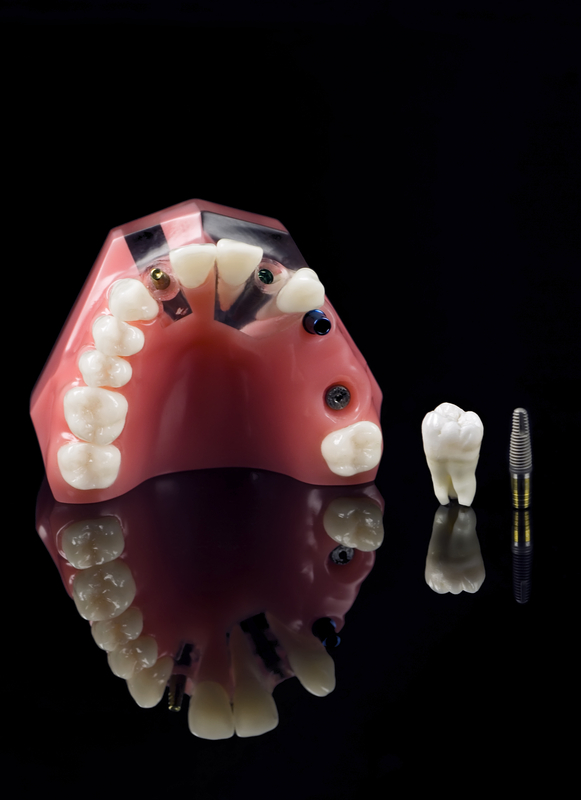 If any damage occurs later on, a single-tooth implant is very easy to restore. If someone is missing multiple teeth, an implant-supported bridge may be the best solution for restoring total dental function. While a traditional bridge can negatively affect neighboring teeth, an implant-secured bridge does not. Similar to a single unit implant, an implant supported bridge is easy to restore if there are any wear and tear issues in the future. These bridges are durable and will look like natural teeth, blending right into the smile. If you are missing teeth or need to have a tooth extracted, contact our Saint John dental office to find out more about dental implants.